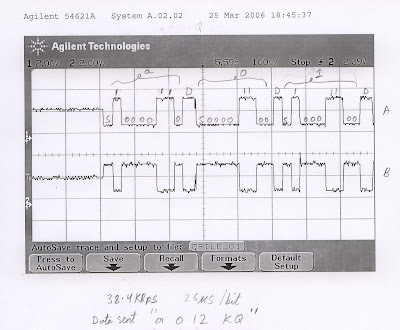 Here is a printout of screen capture of A and B signals of an RS485 Bus as captured on an oscilloscope (Agilent 54621A). The RS485 Bus usually consists of a twisted pair cable connected to an RS485 Transceiver. In the case, below, a twisted pair cable has not been used - the signals were directly observed at the A and B pins of DS75176 loaded by a 120 ohm resistor and biased by two 560 ohm resistors. The bus is bein operated in half-duplex mode. DS75176 (which is equivalent to MAX485) was connected to the UART of Atmega8 AVR Microcontroller. The data being transmitted were the characters: 'a' '0' '1' '2' 'K' 'Q' - in that order. The UART frame format is 8-N-1 and the baud rate is 38.4 kbps. The signals A and B were captured on two different channels both referenced to the common system ground. This waveform was captured while me and my classmates were working on our final year project at the end of our undergraduate engineering course. The reports of this project titled "Multi-Utility Sensor Network" are here.